Finally .. had a little time to enter the Chunky ATC arena. Covering 6 sides rather than one is embellishment heaven! 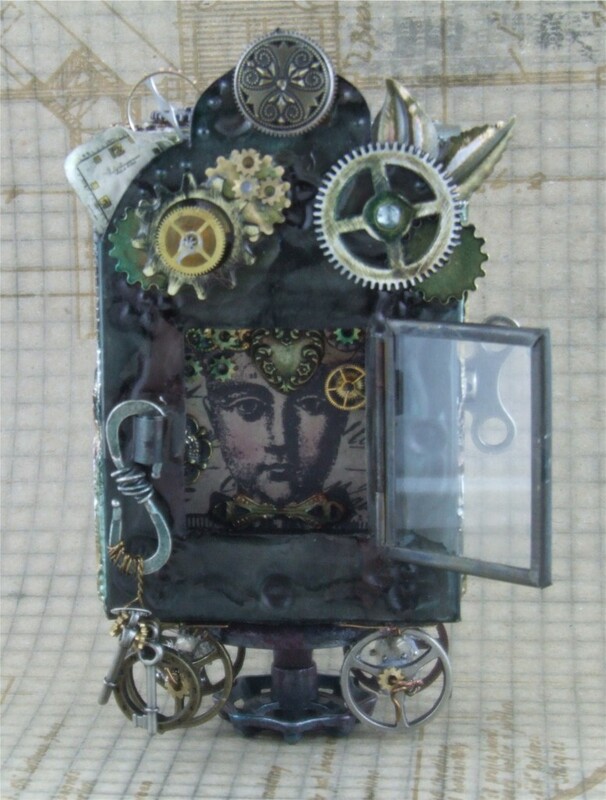 The potential for “junking” it up are endless, well almost! 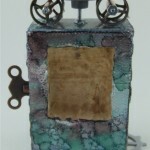 One must keep in mind that the little wheels on the bottom can only hold so much before it falls over (I had to reinforce the base with a few Tim Holtz faucets!). 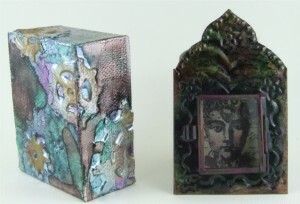 I had one of those little metal shrine boxes for quite some time and thought that it might be cool to use it to create a little niche in the ATC block. 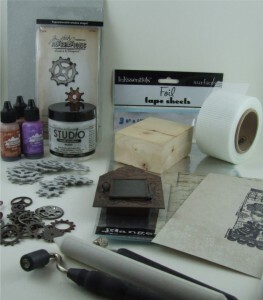 To create this Chunky ATC you will need an assortment of items: Tim Holtz grungeboard, Idea-ology findings, Tim Holtz Alterations Shapers & Movers Gears and On the Edge Gears, Ranger Foil Tape, Matte Medium, Tim Holtz Adirondack Alcohol Inks, Ranger Black Archival Ink Pad, Rubber stamp – Ladies Face, (I used a Paper Artsy image), Wood block cut to 3.5″ x 2.5″ x 1.5″, Drywall repair tape, small box (metal or chipboard) for niche in block, assorted tools and embellishments. Using a chisel or router cut out niche opening in block for box to sink into. 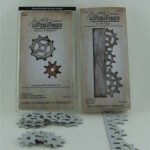 Diecut gears from grungeboard using Tim Holtz Shapers & Movers Gears die and On the Edge Gears. 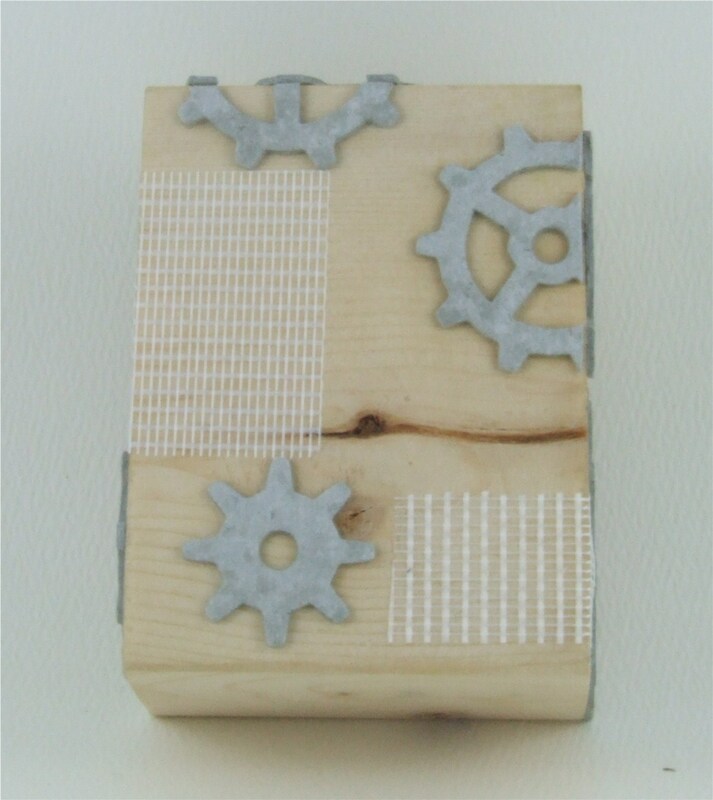 Glue gears to sides and back of block. Do not glue any gears to the bottom or the front of the block. It will need to be flat on the bottom for attaching the wheels. Attach Drywall repair tape in random areas to give a little texture under the foil. When gears have dried cover entire block with Ranger Foil Tape sheet. I found it easiest to cover the top, bottom and front first. 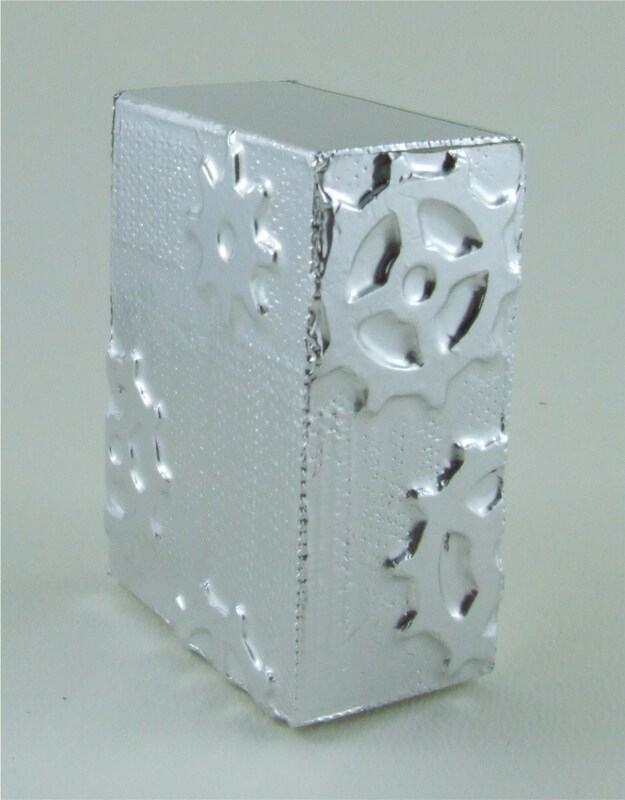 Then the back and sides can be covered in one complete piece (3.5″ x 6″). Cut away foil tape from front of block where niche will be. 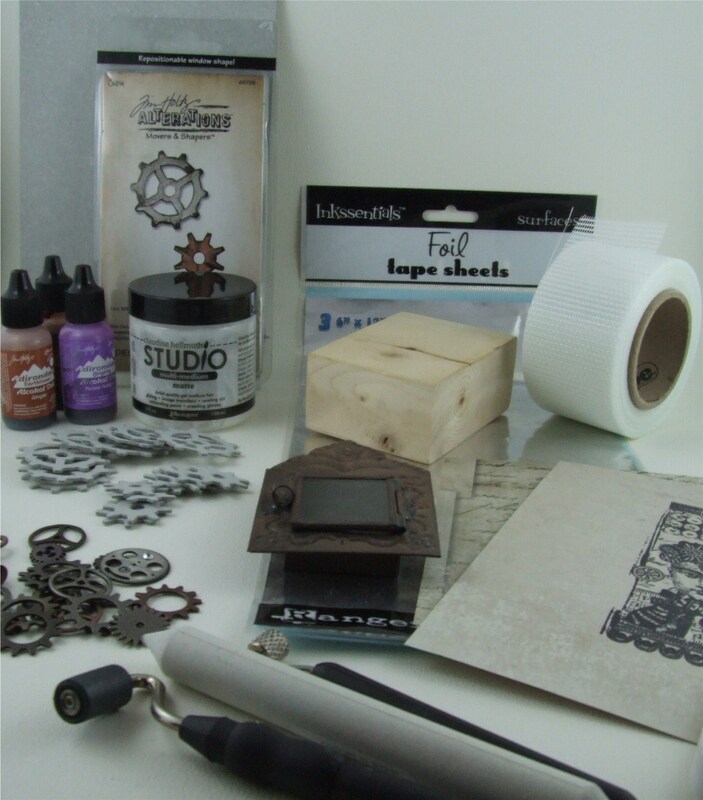 Using a small brayer or paper stump smooth foil into grooves of gears. 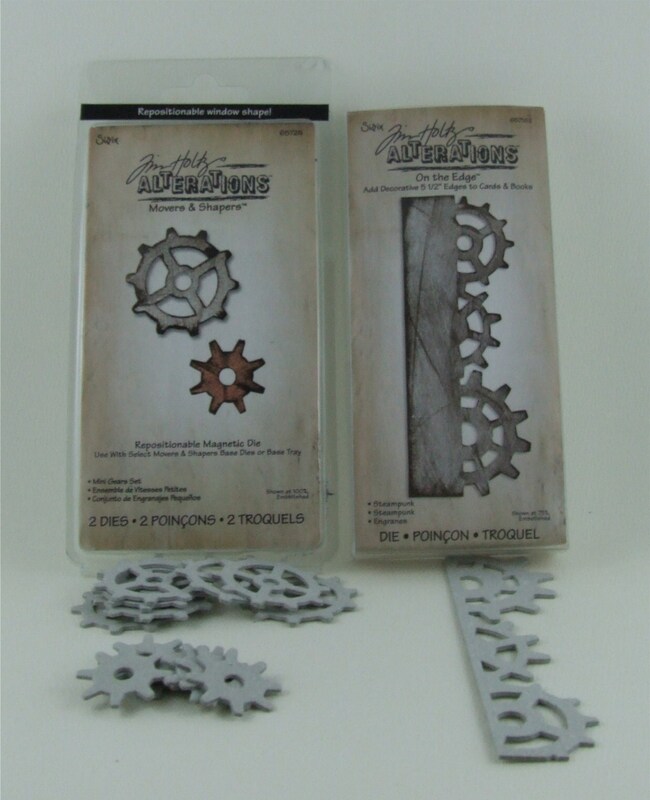 Continue smoothing and working foil into all the recesses of the gears. Using the Black Archival Ink stamp a Lady’s face on a 4″ x 6″ piece of cardstock (I used the backside of Script Blocks from Tim’s Crowded Attic Paper Stash). 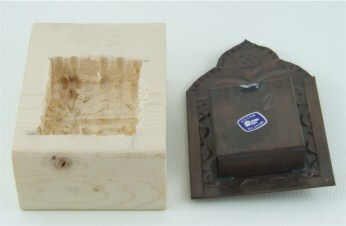 Trim to fit inside the niche box. You can give the face a little bit of color with some Distress Ink pads. ( I used a little Barn Door for her cheeks and Bundled Sage for the background). 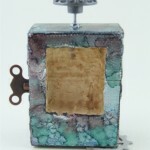 Using Tim’s Ink applicator tool and an assortment of Alcohol inks, color the front of the niche box and all sides of the block. I used a combination of Pool, Purple Twilight, Bottle, Espresso and Ginger. 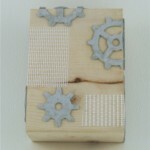 After inks have dried sand the raised areas (gears) and apply a small amount of Gold Mixatives to the gears. 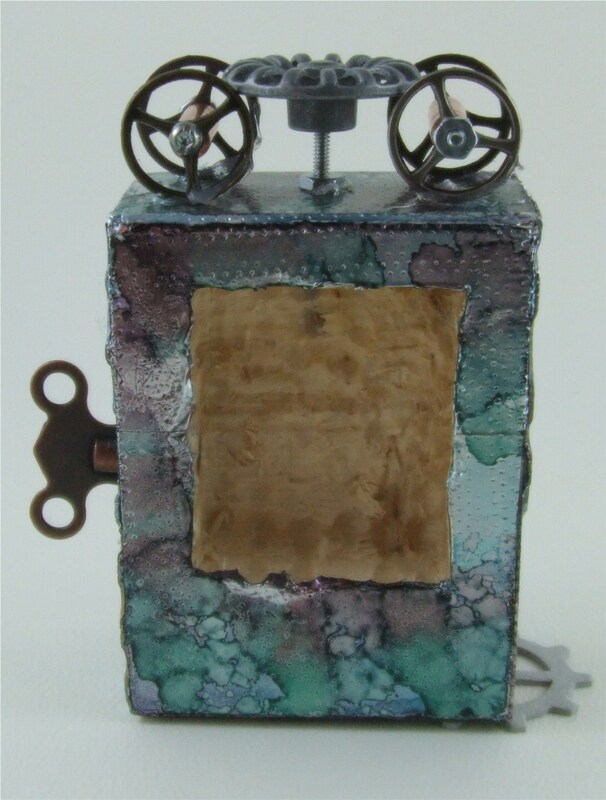 The wheels on the base can be created with Idea-ology Sprocket Gears, a small (1 inch) piece of copper pipe (1/4″) and 4-40×1 Machine screws and nuts. This size screw and nut fits perfectly through the opening in the sprockets. 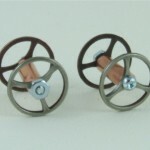 Thread screw through one sprocket, add piece of copper and add a second sprocket. Tighten nut at the end of these pieces. 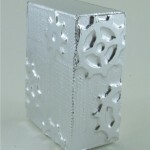 For the Clock key, drill a 1/2″ hole in the left side of the box (picture is showing the box upside down). Insert clock key into left side. 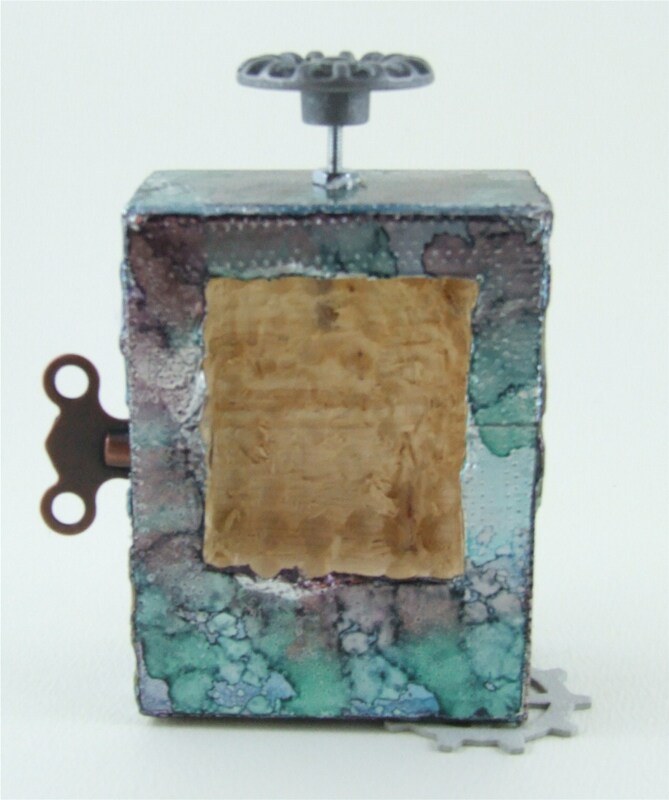 Drill another hole in the bottom of the block and insert a Faucet which extends a little longer than the wheels you created. 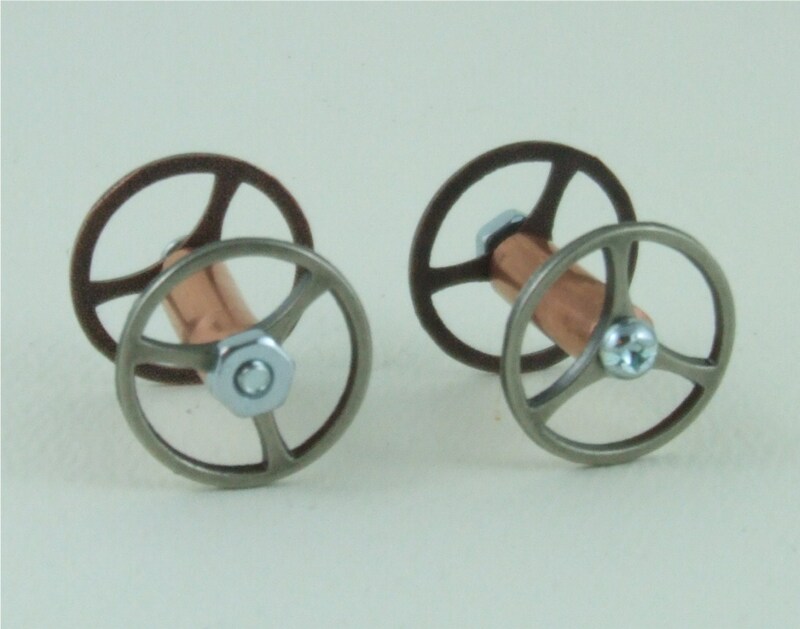 The block will actually be steadied by the Faucet; the wheels are for embellishment more than stability. When you are happy with the placement of all the parts use clear silicone to adhere all pieces to the block. Let dry a few hours. 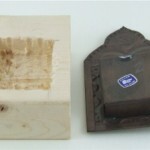 Apply a little silicone to the niche area and insert the box into its opening. 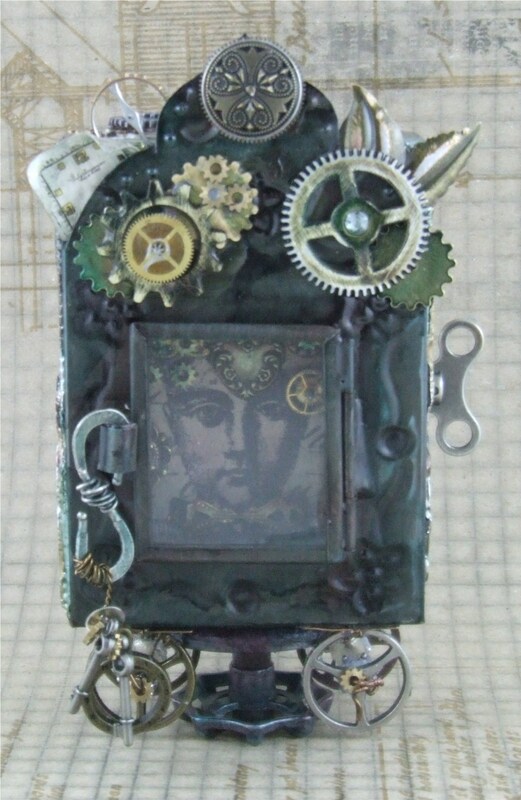 Using Matte Medium and small tweezers add an assortment of hardware to your block. Sue, this is great!!!! 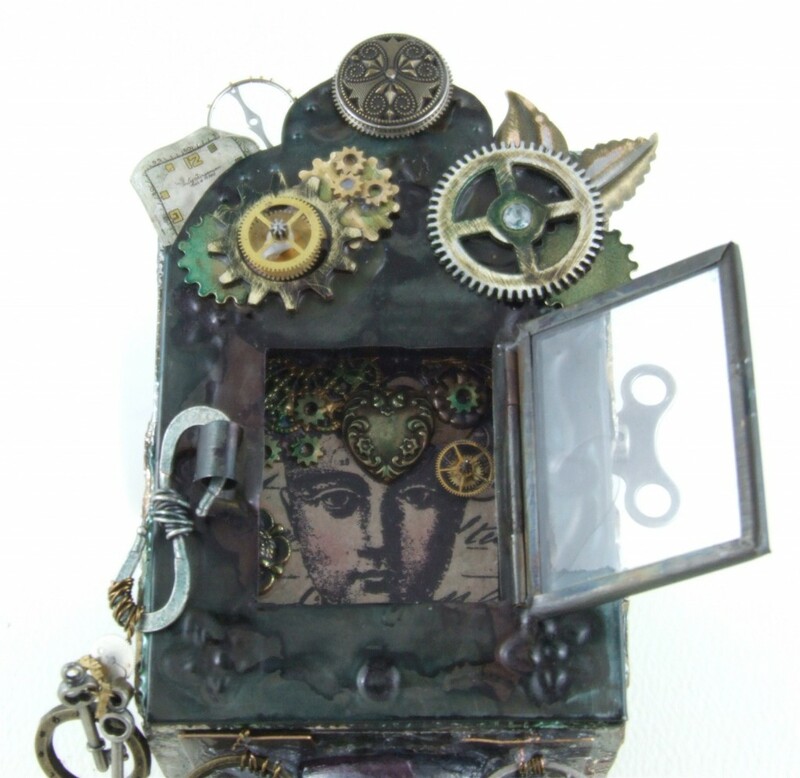 Like everything you make, I love your creations…. This is outstanding. Great tutorial. Thank you! Susie you are so talented!! !